Cancellations received in writing on or before October 19, 2018 will be subject to a $40 administration fee. No refunds will be granted for cancellation or non attendance after that date. Registration is transferable and substitutions are welcome in the event that you cannot attend, however all substitutions must be submitted in writing on or before November 16, 2018. Liability: Providence Health Care hereby assumes no liability for any claims, personal injury, or damage to any individual attending this conference that may result from the use of technologies, program products and/or services at this conference that may arise out of or during this conference. 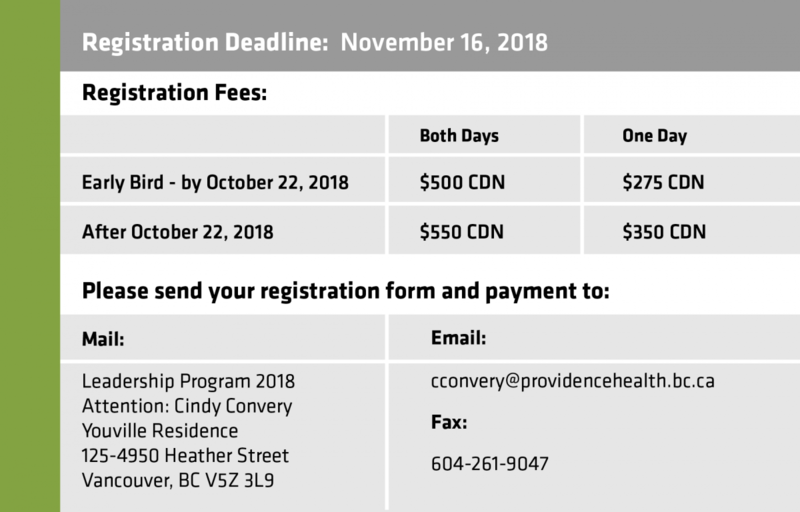 If you have any questions about the registration process, please call Cindy Convery at 604-806-9595.